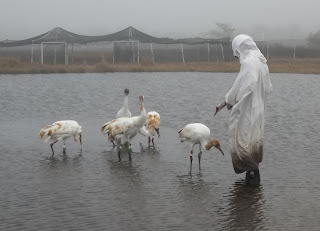 For those of you who are my facebook friends know of my fascination with the Whooping Cranes. Whooping Cranes were almost extinct. The population was down to 15 in the 1940's. The population is on the increase but not without the help of individuals who have dedicated themselves to saving this beautiful bird. One day while traveling a back road from our home to Berlin WI, we noticed several campers and a trailer with the name Operation Migration on the side. After a little research we realized that this local marsh area was where they were raising the baby Whooping Cranes. A couple weeks after seeing this trailer we attended a Crane festival in Berlin. It was during that time we learned about Operation Migration and the work they were doing. They raise the chicks by wearing costumes so the birds never see a human. They need to remain completely wild. In late fall, they help the birds migrate with an ultralight airplane (as shown on the trailer). It is a site to behold and I wanted to see it so bad. There were viewing sites a short distance from our house, but due to delays we missed the first leg of their journey. They left around September 28, 2012. Finally after many migration days the cranes arrived to a wildlife area in Florida on November 22. They spent the winter learning to fish and survive without the help of humans. 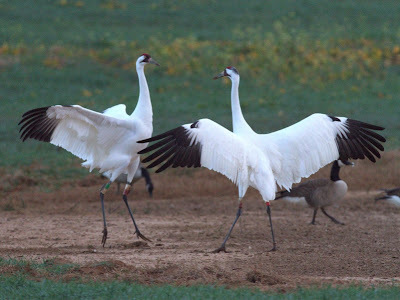 Six cranes began the migration from the White River Marsh near Princeton Wisconsin. One died during the migration from a broken leg, one died in Florida by being killed by a coyote, one disappeared and hasn't been located and the other three took off last week. Hopefully they imprinted and will return to this area. Everyday I watch out on our marsh to see if these beautiful Whooping Cranes stop for a bite to eat before returning to the sanctuary of the White River Marsh. Many sandhill cranes have come through already. All the details of this can be read about on the operationmigration.org website. Read the field notes for details of the journey. If you start http://operationmigration.org/InTheField/page/21/ you can follow all 57 days of migration.